People on the Move in the Social Business IndustryPlease congratulate these folks, in our last On The Move of the year. Pete Blackshaw, long time industry expert joins Nestle as new global head of digital marketing and social media. Pete spoke at our recent Rise of Social Commerce conference, congrats Pete this is one of the highest profile job promotions in the space. Ross Mayfield joins SlideShare as VP of Business Development, and will remain Chairman of Socialtext. I’ve known Ross for a few years, and have always been impressed with his commitment to community. Chris Heuer joins Deloitte Consulting, helping to spear head the social media practice as Specialist Leader (aka Senior Manager) with a focus on Social Media, Enterprise 2.0, and Innovation. I’ve known Chris for many years, and he’s always been a community advocate, such as his founding and growing Social Media Club. Melissa	Turlej	joins	Edelman	as	Senior Account Manager	Senior Account Manager within Edelman Toronto’s digital practice. Joy	Taylor	joins	FreshNetworks	as	Group Account Director	Manging, developing and growing existing accounts. Shannon	Johlic	joins	Today’s Bit	as	Director of Marketing, Strategy/User acquisition	Responsible for the development of the company’s entire Marketing Strategy with a focus on user engagement through social media and user acquisition via paid and organic mediums. Dawn	Skowronnek	joins	Moss Media Labs as	Director of Client Engagement Conducting educational workshops, developing client strategy and implementation, and coordinating special events. Ryan	Tuttle	joins	BrightWave Marketing as	Vice President of Strategic Services	Ryan will help lead BrightWave’s growth plans, working closely with clients to enhance their programs while also developing additional services and offerings. Jennifer	Cooley	joins	Buddy Media as	General Manger, Media Solutions Jennifer brings expansive sales and media industry experience to Buddy Media where she oversees Media Solutions. David Dowd joins	Buddy Media as	General Manager, Lifestyle Sales	David brings vast experience in content and business development and will oversee sales across its lifestyle business with verticals such as retail, fashion, healthcare, real estate and beauty services. Jed	Weitzman	joins	Buddy Media as	Director, Entertainment Sales, Jed brings 17 years of experience in the entertainment industry to Buddy Media where he will lead sales efforts for movie studios, music labels, production companies, and artist representation and management. Tami	Dalley	joins	Buddy Media as	Director, Analytics Tami Dalley will oversee analytics at Buddy Media. Patrick Stokes is promoted at Buddy Media as	Chief Product Officer He will lead and oversee all development of the Buddy Media Platform. Michael	Jaindl	is promoted at Buddy Media as	Chief Client Officer He will lead the Buddy Media client services teams. Greg	Roth is promoted at Buddy Media as	VP, Buddy Media University He will lead Buddy Media’s hands-on training center, which provides clients with training on all aspects of the Buddy Media Platform, including a free certification program. Chad	Kaszer	joins	Sony Corporation of America	as	Director of Social Media Communications	Responsible for social communication alignment across all Sony divisions in the US, as well as leading all social aspects of Sony’s United brand communication efforts. Colin	Alsheimer	joins	Weber Shandwick as	Account Supervisor	Creating and executing social media strategies for national clients. Kate	Carruthers	joins	Sydney IVF	as	Digital and Community Manager Developing the web strategy and executing the new social media strategy for Sydney IVF. 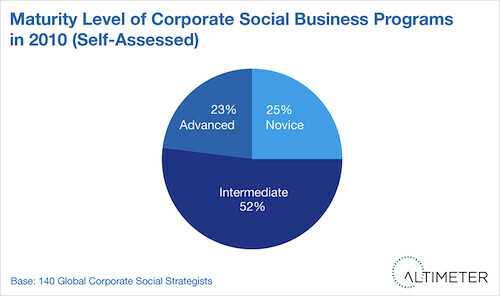 What’s the future of social business? I gave my industry forecast based upon upcoming research data, on the Silicon Valley show on NBC called Press:Here. Listen in to hear our discussion with Sarah Lacy (who has a new book about entrepreneurs) from Techcrunch, Richard Waters from Financial Times, and host Scott McGrew. Investor funding vs Enterprise spending –why is there a disconnect? How much brands should spend, or should spending stay small? 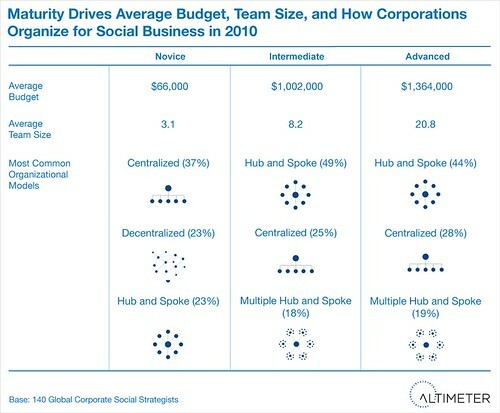 What’s the top spend in corporations in social business? Why I think Industry Analyst is a limiting term. Find more of the Forecast data for 2011 I released on stage at the LeWeb keynote. 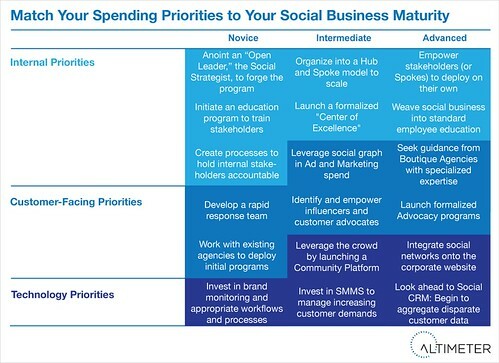 More forecast data based on spending by social business maturity tomorrow, stay tuned. Each time I ask this question on stage, most hands vote that Facebook has more information, although someone usually suggests the United States Governmant can obtain it if they need to. In fact, the amount of consumer data emerging in the social web only continues to hockey stick (see this graphic from Twitter) The following is a summary of a research project we did to understand how to harness new data types in their online experiences. We segmented data that has been tried and true for years on the top tier: demographics and product. Then, we segmented data that digital marketers are striving to tackle now in the middle tier: Pschographic, behaviroial, and refferal data. At the bottom tier, we listed out experimental new types of data that most companies have not harnessed, the newcommers location based and intention data. This data types enables an effecient way to create context about consumers, yet broad survey-based research may not yield specific nuances and needs about specific individual taste as today’s consumers are given more choices and have more discrete needs. Some marketers are able to glean demographic data from social accounts gender, age range, by profile data, profile pictures, or searching public records like Zabasearch and Spokeo. A data type commonly used in ecommerce websites, this data type is used to match similar products with each other, in order to cross-sell and up-sell products. Often combined with demographic data, this data type, mixed with referral and behaviorial data yields greater accuracy. Visit any ecommerce website from Amazon, BestBuy and beyond to find examples of product matching. As the social web exploded in the past few years, consumers are volunteraily self-expressing their woes, pains, and aspirations in websites. This provides those who want to reach them increased opportunities to market based on lifestyle, painpoints, beyond just product sets. This data type is useful in both message and conversation creation as well as identifying features and products to improve or fix. To learn more about lifestyle and pain point positioning see the 5 stages of positioning by Lifestyle, Pain, Brand, Product, or Features. There’s at least two ways to find this data, it’s in both existing customer records like CRM or ecommerce systems or also in the “digital breadcrumbs” that users are leaving in social networks using a variety of web techniques from cookies, FB connect, and other social sign on technologies. The opportunity to suggest content, media, deals, and products to them that matches their previous behaviors will yield a greater conversion. Customers are emitting their recommendations for products, but positively –and negatively. Both explicitly through ratings and reviews, as well as implcity though gestures like the ‘like’ button to their social network. Vendors like Bazaarvoice (disclosure: client) offer a suite of tools for customer feedback and intelligene, Zuberance fosters positive WOM through positive ratings, and ExpoTV is a catalyst for conversation using video reviews, and see the well known case study from Levi’s who implemented the Facebook Like button. As location based technology and services emerge for consumers to emit signals where they are using mobile devices, this data helps to triangulate context around location and time for brands to reach them. From Foursquare checkins and the associated contextual ads that emerge to ‘players’ to Facebook places, consumers can now emit their location, in exchange for contextual information, see how Awareness Hub (client) is able to surface influencers by location in Foursquare Perspectives. Savvy marketers will harness explicit content and serve up the right messages in advance – as well as poach from competitors. Learn more about intention data –which is faster than real time. In our initial findings we had many other types of data, but organized these in as discrete buckets as possible. 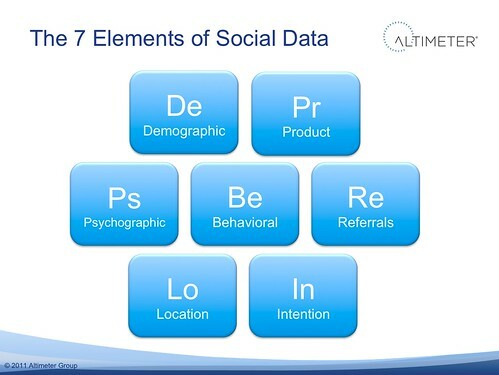 While this seven segmentation types makes sense today, we expect many other types of data to emerge just as technology and consumers do. Be sure to use in combination for reaching maximum potency in your ‘data elixir’ –relying on only one is no longer sufficient. Want to learn more? I did an hour long webinar on this topic, you can watch the replay at NetBase, who hired me to present this original research. Scott attended the webinar, and reviewed the highlights. Thanks to Altimeter’s Christine Tran for help on this project. 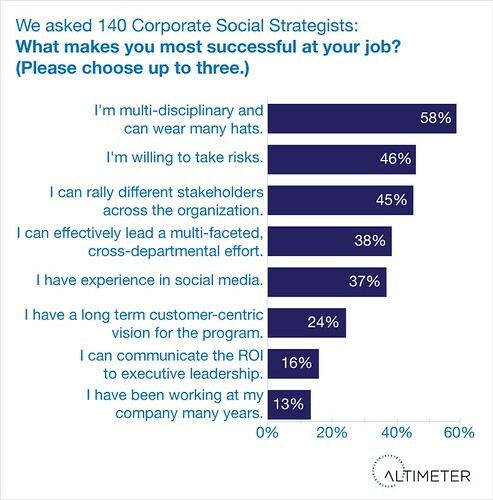 The following data and insights is just a subset from Altimeter’s recent in-depth report on the primary business decision maker in large corporations, please read the “Career Path of the Corporate Social Strategist” (Open Research) first. You’ll find the report is filled with data around job titles, duration in role, department, responsibilities, challenges and aspirations. Next, you can see the actual list of these strategists segmented by industry, and then see how hiring has changed in the “On the Move” series. Many years ago, (now I sound old) I had this role at Hitachi, before Facebook and Twitter were viable options. In the full report (here’s the link again), we know that most have been working for just over a decade, most are in marketing or corporate communications, the data on their background matches this nicely. 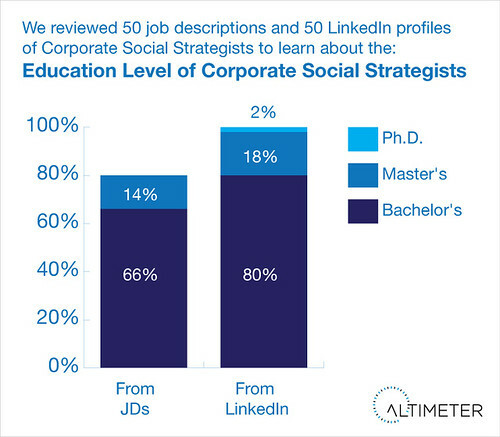 For today, Communications and Marketing are ideal education backgrounds for social business. his group was more educated than the job requirements were listed by the hiring companies. All of the those we surveyed had an undergrad, and a handful having advanced degrees (18% had Master degrees) and one respondent had a Ph.D. It makes sense that the first role to be severely impacted by social was corporate communications, as the influence flow from bloggers and customers caused a serious disruption from 2005-2008 with mainstream media picking up these stories and amplifying them. When we modeled the data, we included degrees in English, Journalism, Communications into that first line item. Yet expect over time the degrees to shift out to a wider segment. 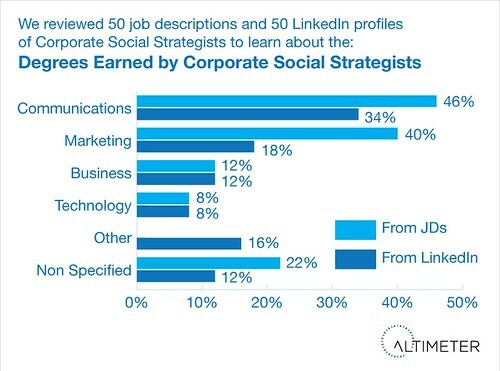 While the corporate social strategist is often the leading the ‘hub’ within the company, I expect this to shift to a stand-alone social media group, and then strategists to appear at the ‘spokes’ starting with support, then product, and then into regional areas. When the role starts to permeate beyond marketing and communications, expect a new class of degree requirements to appear. Not For The Timid: Be Prepared to be Flexible and Willing to Stick Your Head Out. No doubt, this individual is leading change management within the status quo culture within a corporation, we call these individuals ‘Open Leaders’ who are willing to give up control to gain more influence. These professionals must be proficient in a number of skills such as communication, education, persuading, knowing technology, crises management, and program management. Additionally, because they are changing ‘the way things have always been done’ they must be willing to take risks, and work with stakeholders across the entire company. 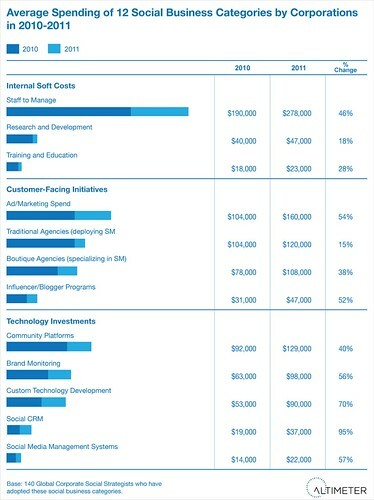 Our 2011 social business forecast data indicates that corporations will spend their largest line item on staffing up the social business team, so if you’re seeking a role during a recession, there may be opportunities for you. In the past we’ve seen some real scrutiny placed on the journalism and communications practice, and I’m here to tell you that the data supports that the innovative practitioners have already adapted these new technologies and there are some ripe opportunities. If you’re a student now that is studying communications and marketing (or a professor guiding them), I’d love to hear your thoughts below in the comments. If you’re teaching in these courses, please feel free to use our research reports under the Creative Commons licensing that we specified in the report –it’s intended to share with attribution. Also to keep some perspective, while the Corporate Social Strategist may be the leadership position, there are many other roles in the team, as we’ve started to explore in this Quora thread, also see Focus.com, which has a B2B slant where I posed the same questions.